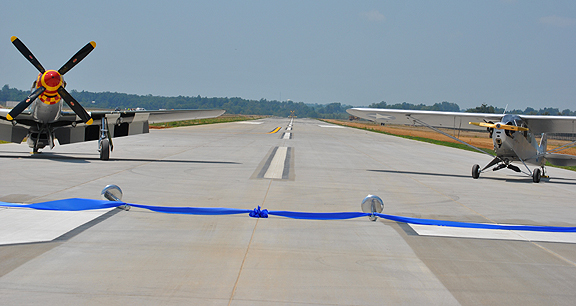 Project obstacles and solutions: On August 4, 2010, the Lexington Bluegrass Airport dedicated and opened its new Runway 9-27, a 4,000 ft crosswind runway. IMI officials joined Kentucky Governor Steve Beshear, Lexington Mayor Jim Newberry, along with Kentucky Department of Aviation and FAA officials at the ribbon cutting ceremony. ATS of Lexington, KY was the general contractor for this project. Shamrock International was subcontracted for the paving of the runway. Given the tight time constraints and the enormity of the project, IMI placed a portable concrete plant on the site. The job required up to 1,000 yards per day. Having the portable on site ensured that the customer had the volume of concrete requested each hour. The project also posed a quality control challenge. As you can imagine, there are very high standards on the strength and long-term performance of concrete used to pave a runway. Weak areas of concrete can crack and break down under the strain of air traffic. There are very stringent strength tolerances in such situations. Of particular concern was the flexural strength, not just compressive strength, of the concrete. There was a total of 38,703 yards used in the construction of the runway. IMI did extensive testing of materials and concrete batches to make sure that the engineer’s specifications were met for both compressive and flexural strength. As a result, there were no low breaks in the concrete. Runway 9-27 replaced an aging and shorter runway as a part of the airport’s 2004 master plan. Realigning the new runway added 500 ft to its length and opened much needed space for future expansion by the airport.